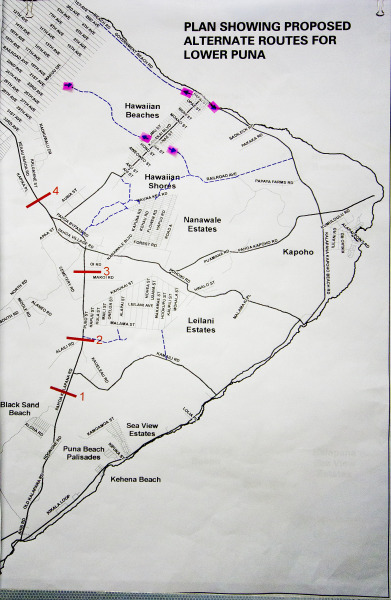 Volcanic Activity Summary: The June 27th flow front is stalled 2.3 km (1.4 miles) upslope from Apa`a St. and 3.3 km (2.1 mi) from Pāhoa Village Road; however, fresh lava broke out of the tube 5.4 km (3.4 mi) behind the flow front, suggesting that lava is slowly reoccupying the tube. 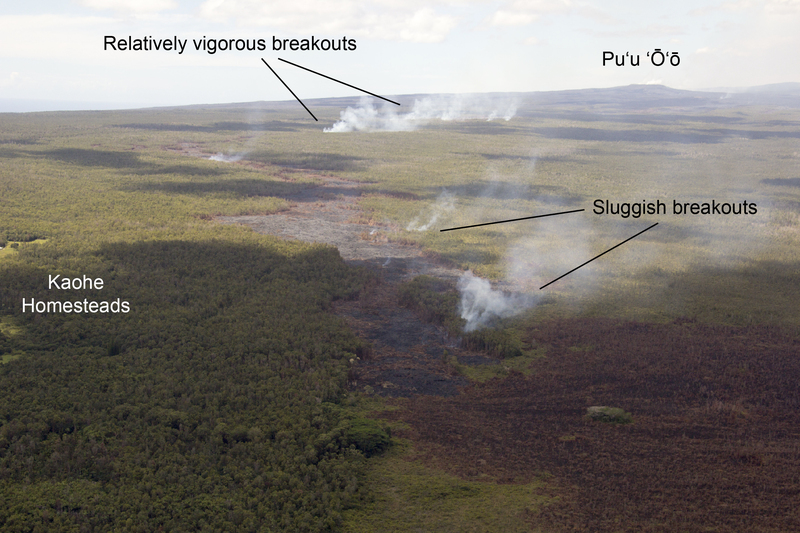 Minor activity continues at several locations between the fresh breakout and the flow front in the form of residual lava oozing from the flow margins. The stalled leading edge of the flow was approximately 16.4 km (10.2 miles) straight-line distance from the vent. Because the flow did not advance over the past few days, we do not offer a projection of its future movement. These estimates will be revised after our next overflight, now scheduled for Monday. Pāhoa town is in the Puna District of the County of Hawai`i. 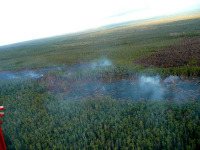 Recent Observations: Leading edge of the lava flow is stalled at the flow front, but fresh lava is being resupplied through the tube to a breakout point 5.4 km (3.4 mi) behind the stalled leading edge. 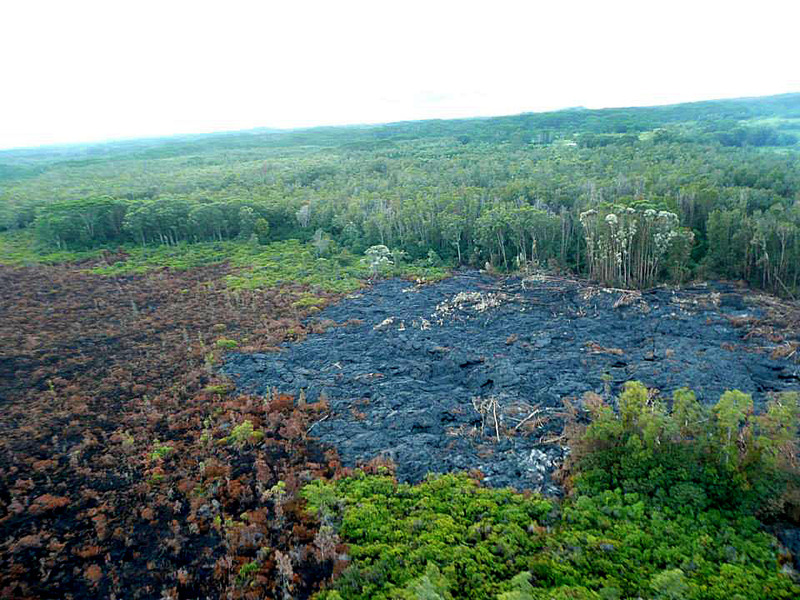 Hazard Analysis: Lava flow from Pu‘u ‘Ō‘ō vent stalled but remained active with fresh lava being supplied behind the front. 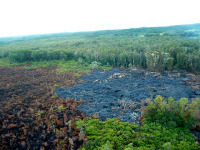 Remarks: The Pu‘u ‘Ō‘ō vent in the East Rift Zone of Kīlauea Volcano began erupting on January 3, 1983, and has continued erupting for more than 31 years, with the majority of lava flows advancing to the south. 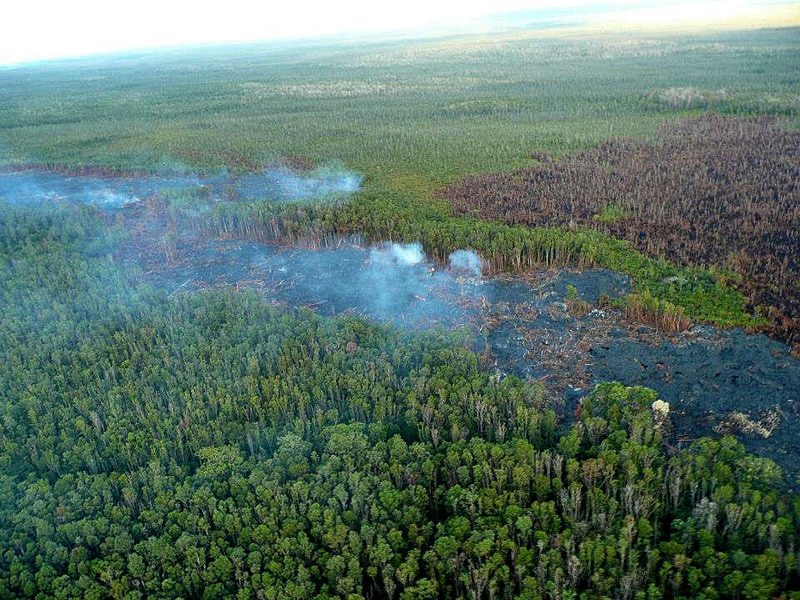 Over the past two years, lava flows have issued from the vent toward the northeast. The June 27th flow is the most recent of these flows and the first to threaten a residential area since 2010-2011. 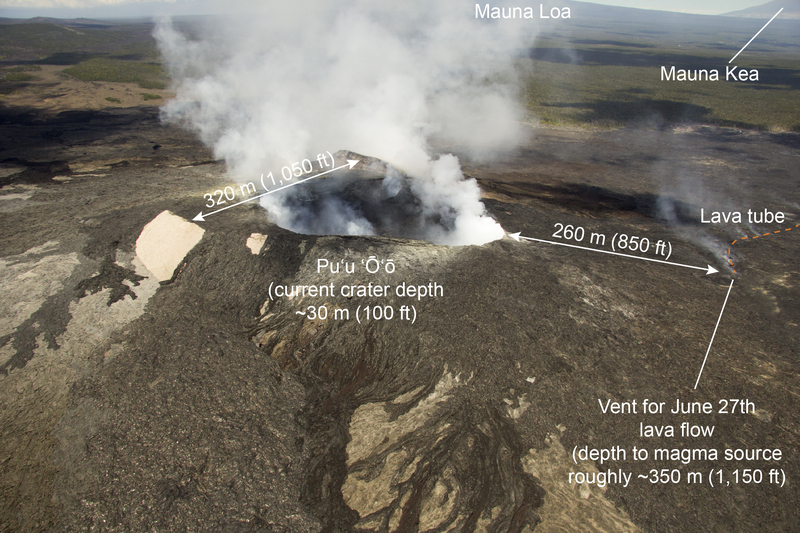 On June 27, 2014, new vents opened on the northeast flank of the Pu‘u ‘Ō‘ō cone and fed a narrow lava flow to the east-northeast. On August 18, the flow entered a ground crack, traveled underground for several days, then resurfaced to form a small lava pad. This sequence was repeated three more times over the following days with lava entering and filling other cracks before reappearing at the surface, in two of the cases farther downslope. 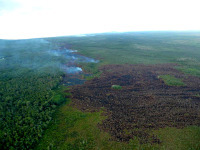 Lava emerged from the last crack on September 6, forming a surface flow that initially moved to the north, then to the northeast, at a rate of 400 m/day (1,300 ft/day). The flow slowed thereafter and, between September 12 and 19, the rate of advancement varied, averaging 225 m/day (740 ft/day), finally stalling over the past week. 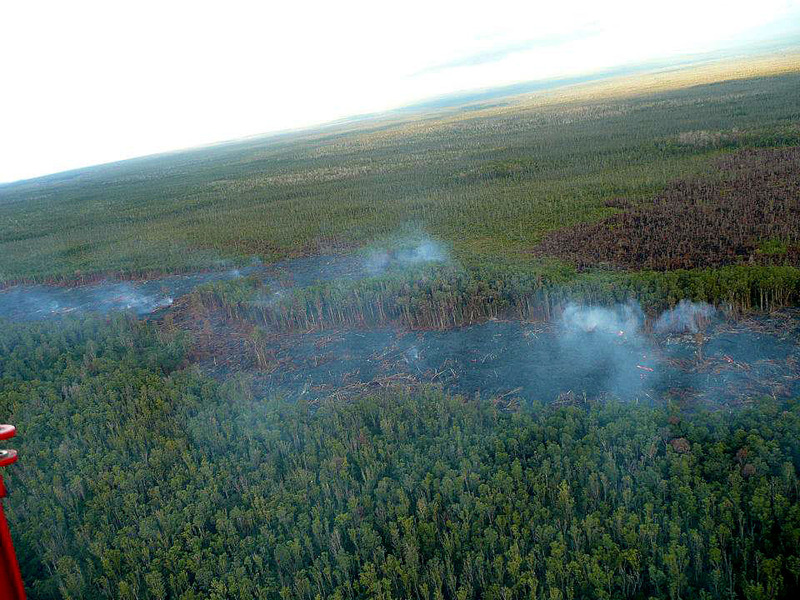 The lava outbreaks upslope of the flow front on its North side, where the smoke is. Photo taken Friday morning, September 26, 2014. Photograph courtesy of Hawaii County. The leading edge of the Kilauea June 27th lava flow on the left with outbreaks upslope on its North side, where the smoke is, along with the dark burn scar from the brushfire covering much of the bottom right of the photo. Photo taken Friday morning, September 26, 2014. Photograph courtesy of Hawaii County. 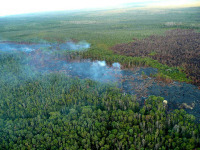 The stalled front of the Kilauea June 27th lava flow. Looking South towards Kaohe Homesteads. Photo taken Friday morning, September 26, 2014. Photograph courtesy of Hawaii County. 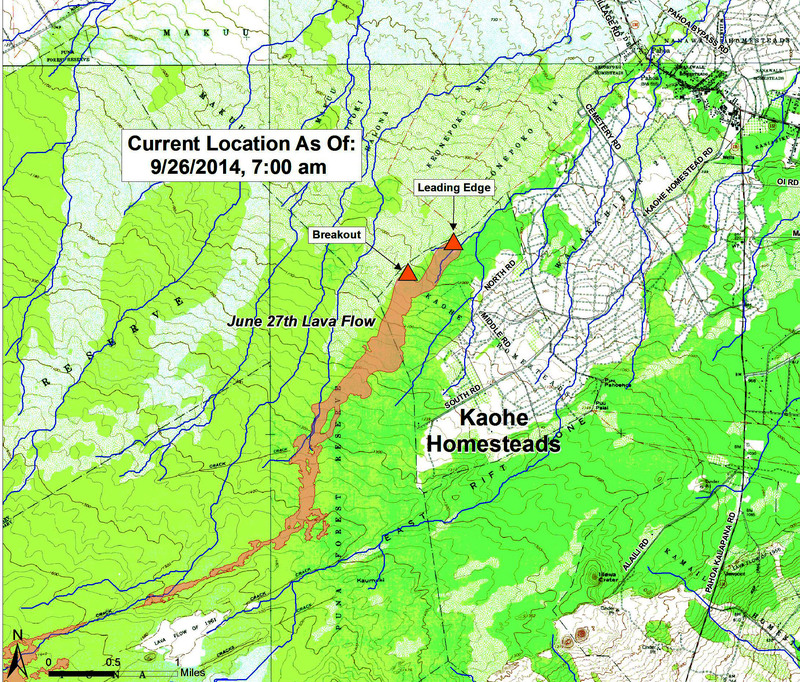 Position of the Kilauea June 27th Lava Flow as of 7 a.m. Friday, September 26, 2014. Map courtesy of Hawaii County Civil Defense. 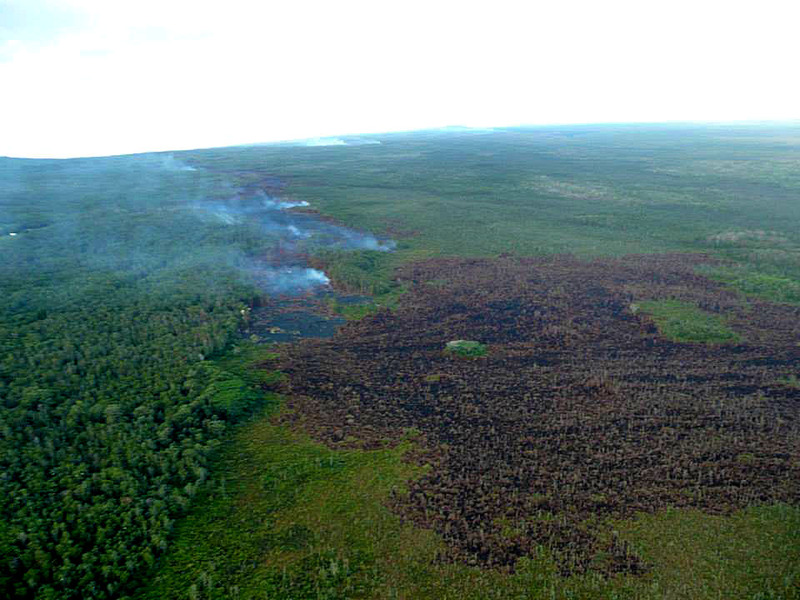 This morning’s assessment shows the leading surface lava flow has remained inactive and has not advanced. The small breakout flow upslope from the leading edge along the North flank also appears to be slowing and decreasing in activity. That breakout has advanced approximately 35 yards since yesterday and remains further upslope and to the North and does not pose an immediate threat to area communities. No evacuation is needed at this time and area residents will be given adequate notice to safely evacuate should that be necessary. HELCO crews will be working in the Government Beach road area and digging holes to allow for the installation of power poles. This will result in the road being blocked and the access will be limited to beach road residents only to minimize disruption and delays to the operations. The public is reminded that the flow is not visible and cannot be accessed from any public areas. Access to the Kaohe Homesteads subdivision will remain restricted to area residents only. We would like to thank everyone for your patience and understanding and your cooperation and assistance is greatly appreciated. The County of Hawai‘i has established an Incident Command Center and Informational Resource Center at the Pāhoa Community Center. Residents are invited to the information center from 8 a.m. to 4 p.m. Monday through Friday for answers to their questions. 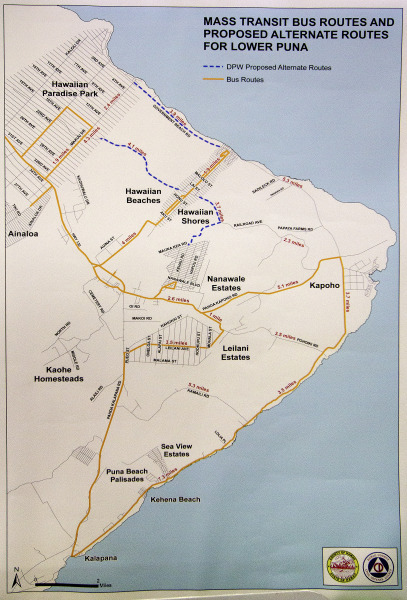 Hawaii County Mass Transit proposed routes. Displayed at the Lava Flow Informational Fair Saturday (Sept 13). Potential evacuation routes/alternative roads crews are working on.